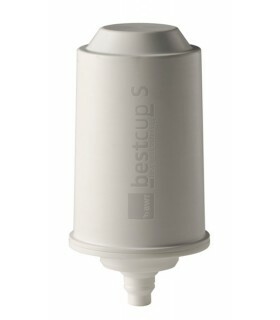 BWT bestcup tank cartridges can be used with a special adapter in the tanks of most standard coffee machines. Unique water optimisation, using BWT bestcup’s advanced technology, targets and reduces the carbonate hardness (calcium content) to provide clear, particle-free water with no unwanted taste or smell. This results in the very best possible coffee water, exceptional coffee enjoyment and protection of the equipment. Precious minerals are retained in the water, creating a perfect aroma and crema for all types of coffee. BWT bestcup will meet the professional standards of coffee connoisseurs and amateur baristas.